Join us at one of the most pristine beaches in Goa for this very special yoga retreat. Lindsay Nova (USA) and Julia Grommes of Featherlight Yoga (Austria) have teamed up to bring you a delightful and relaxing exploration of aerial yoga, vinyasa, and yin in a beautiful outdoor setting. 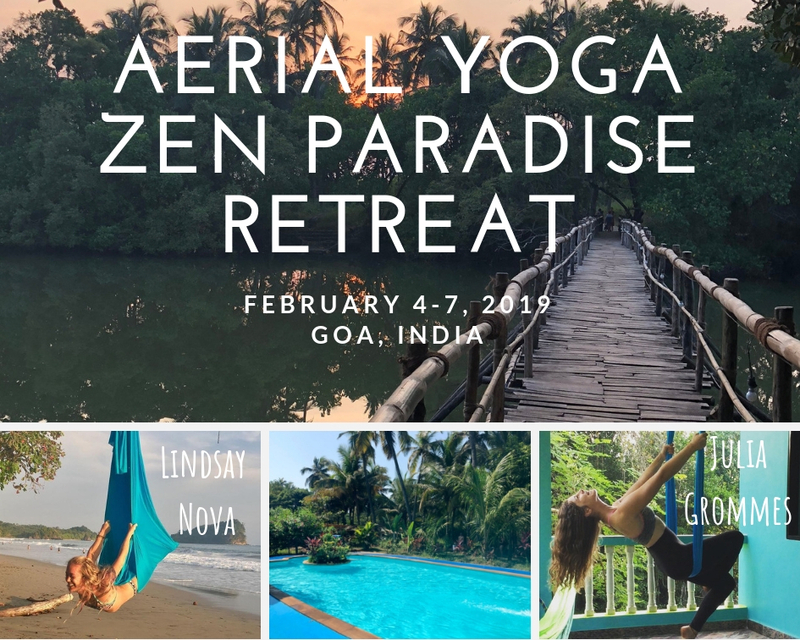 Treat yourself to one of the most desired beaches in India while deepening your practice or trying something new with aerial yoga! Flips & tricks, restorative aerial, and epic sunsets are all on the agenda! Ready to expand your tribe and fly with us? I learned that flexibility is more accessible through the use of a hammock in an aerial yoga or anti-gravity based class. I doubted initially that I could do some of the poses and with proper guidance was able to overcome the doubt and surprise myself. I really could be a testimonial to the improvement of flexibility via aerial yoga. I wanted to share the compliment from one of my yoga teachers to you that in one week he was floored at the change. My flexibility in floor practice increased substantially. 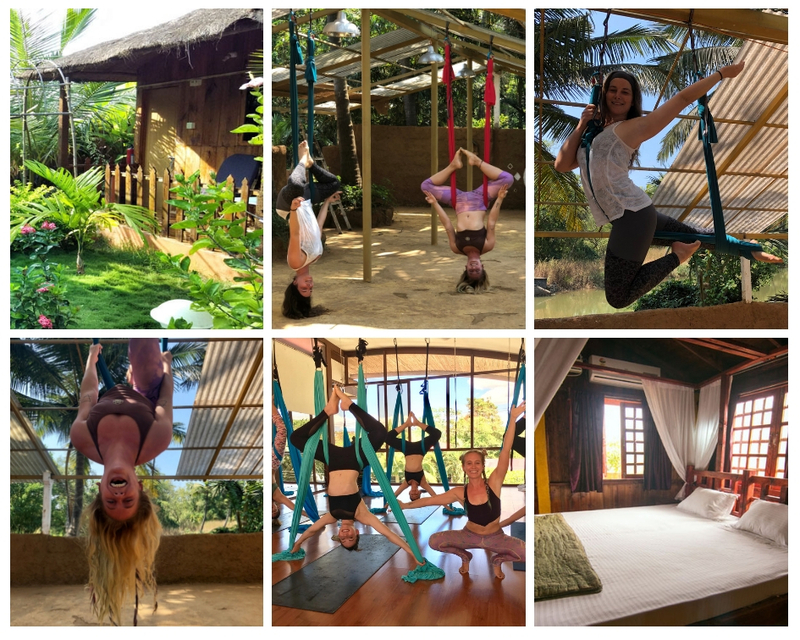 Learn to fly with aerial yoga in the stunning paradise of Goa, India! Take flight into new realms of possibility in your body and mind through the practice of aerial yoga in our intimate, small-group healing environment. You will learn basic inversions by going upside-down! Aerial yoga is a form of inversion therapy which helps decompress the spine. It’s also an all-natural mood booster! Not to mention, you can become strong just like someone who trains in the circus. Stretch deeper into yoga poses through the use of the yoga swing and natural gravity. It is a fun and playful practice, sure to leave you energized and feeling good. Lindsay Nova is a traveling yogini, healer, and performance artist. She teaches aerial yoga and vinyasa around the world as well as on 200-hour teacher trainings in Thailand and India. 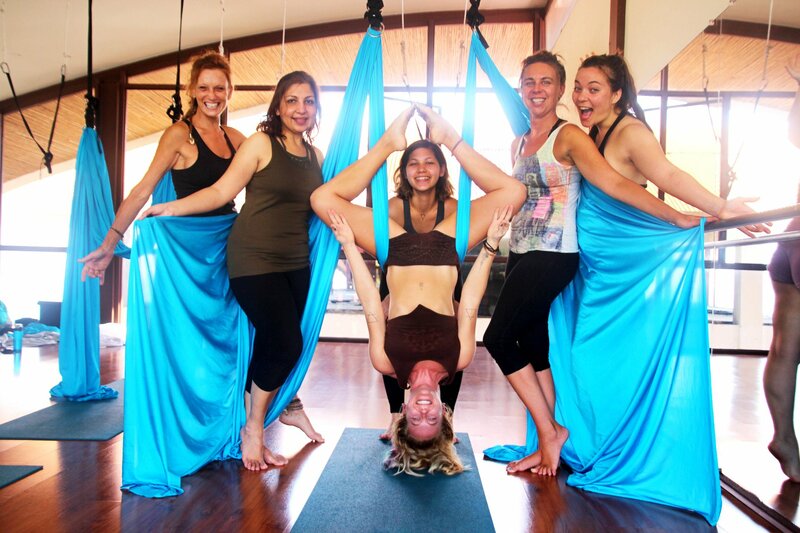 Lindsay is excited to share her aerial yoga curriculum with you! Her teachings are a culmination of her background in dance, yoga, and circus arts after teaching movement arts for the past 10 years. Julia Grommes is a traveling yogini and hypnotherapist, that has spent her time in India since March 2018, gaining experience and deepening her knowledge in the homeland of yoga. Previously, Julia has taught Aerial Yoga and Hatha Flow around the world (Europe, Sri Lanka, and India). Her functional approach to Yoga Asanas under the influence of the 5 elements according to Ayurveda and Traditional Chinese medicine, allow her to teach a holistic yoga experience. She is passionate about sharing her knowledge, allowing you to fly high, and dive deeper into your inner consciousness. Early bird special by December 1, 2018: Take $100 off! Payment plans available. Travel insurance always recommended. All payments are nonrefundable.